Since 1972, San Diego's Dog Beach has been a legal off-leash paradise for dogs. It offers 38 acres of sand where the San Diego River meets the Pacific Ocean. Please pick up after your pet. 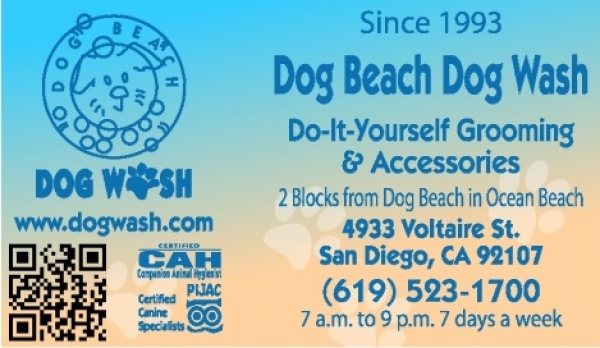 Mindy Pellissier and Jane Donley opened Dog Beach Dog Wash (also known as OB Dog Wash) in 1993 because of their love for Dog Beach, and of the need to wash their then-dog, "Breaker," daily due to skin problems. When they did it at home it took over an hour to clean the bathroom, a load of laundry, and they never felt he was clean enough. There had to be an easier way. Since then, along with a dedicated dog-loving staff, they have hosted more than 450,000 dog washes, conducted hundreds of beach cleanups, and won a dozen awards for their homemade OB Holiday Parade floats. The mission of Dog Beach Dog Wash is to be "clean, friendly and affordable." With thousands of satisfied customers, they hope to continue bringing joy and good health to local dogs and their guardians. USDA Stamped and Inspected for Human Consumption. Premium Natural Oven Baked Flint River Ranch Dog and Cat Foods. The Honest Kitchen's Certified Organic Dog & Cat Foods, Bless the Beasts Dog Shampoo's, Bee Pollen Products, Emu Oils, Plush Pet Beds, crate mats and other Natural Pet Care Products.